Hardscaping vs. Softscaping: What’s the Difference? When embarking on a landscaping project, it’s important to understand the different design elements that go into outdoor living spaces, and how they interplay with one another. These elements generally fit into one of two categories: hardscaping and softscaping. While these may seem like obscure industry terms, it can be useful to understand the difference between the two. This will help homeowners and designers create an appropriate design for the space, using hardscaping and softscaping elements appropriately and in concert with one another to create a fully functional landscape. We’ll begin with basic definitions. The Spruce defines hardscaping as the “non-living elements” of landscaping. This includes paver patios, retaining walls, driveways, fences, benches and the like. Generally, hardscape elements are more practical (patios, fences) but can also be decorative (benches, pergolas). 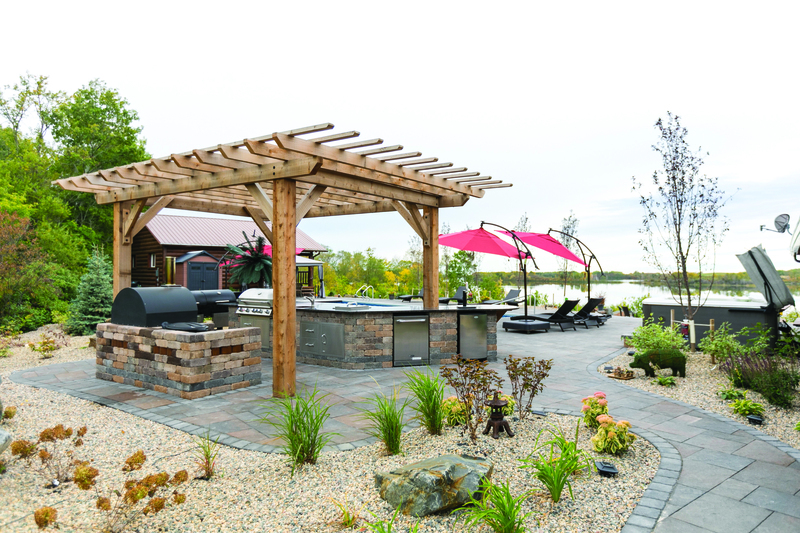 In addition, features such as outdoor fireplaces or water fountains are included under the definition of hardscaping. In comparison, softscaping refers to the living, horticultural elements of landscape. Ultimately, softscape means plants – from grass and shrubs, to annual and perennial flowers, and even vegetables in a garden. The challenge of creating an effective landscape design is figuring out how to mix hardscape and softscape elements together to create a cohesive, functional outdoor space. The two complement each other well – for example, softening the appearance of a fence with tall spring bulb plants, or covering a wall or pergola with vines for a lush, earthy effect. One easy way to mix hardscaping and softscaping is by placing container plants on the edges of a patio. The possibilities are truly endless! 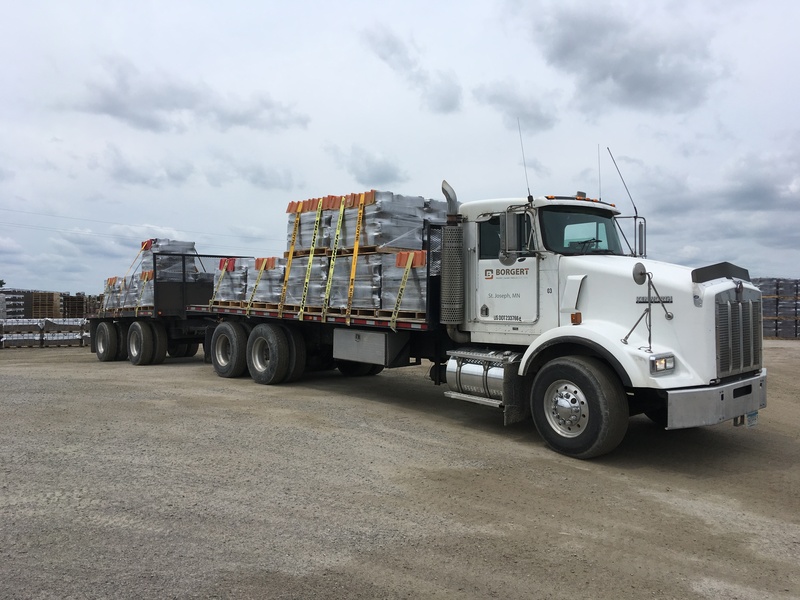 To find out how Borgert Products can help make your hardscaping vision come to life, visit our product galleries or contact us for more information. 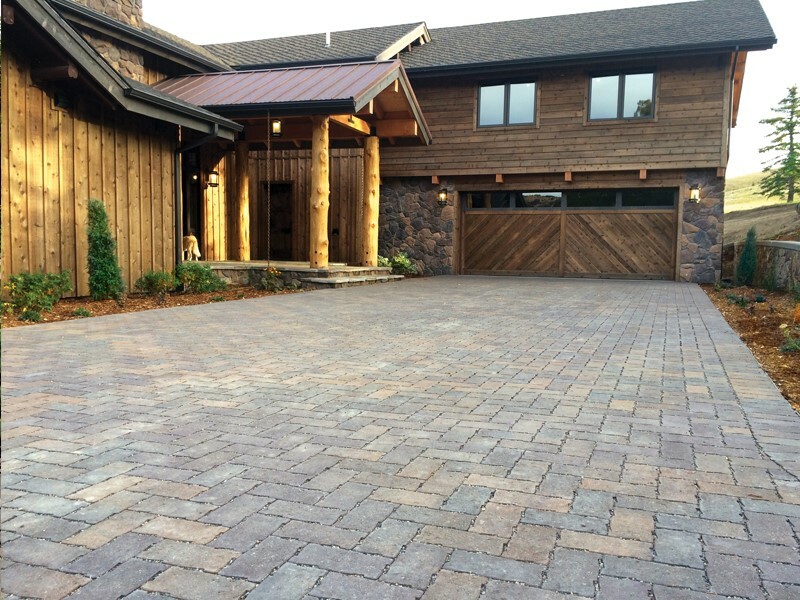 Borgert is a Minnesota-based, family-owned company specializing in pavers, patios, driveways and retaining walls. Since 1923, we have been committed to providing high quality products that help our customers dream landscapes become a reality. Get a quote today on your Borgert products. Our outdoor living spaces are true extensions of our homes. We eat and entertain on patios, laying poolside and hosting friends on warm summer nights. So why shouldn’t a patio be stylish? With Kastle Flats slabs, that is easily achieved. Borgert Products’ Kastle Flats bridges the gap between modern and contemporary, bold and classic. With three available sizes and two color families, this distinctive slab creates endless possibilities for a custom design. The large scale and light texture makes a Kastle Flats patio or walkway unique and memorable. We’ll share a few photos of our favorite Kastle Flats patios below. For more, including pattern examples, visit the product page, idea gallery, or check out our latest catalog. Kastle Flats is available in two shades: Sterling Gray in gray tones and Classic Bronze in brown tones. Here, Sterling Gray was used to perfectly complement the black building and the gray rock, creating a cohesive – and stunning – look. This close-up shows one of the many patterns that can be made with Kastle Flats slabs. Mix and match the three available sizes – 8×16, 16×16 and 16×24 – for a one-of-a-kind design. In larger projects, such as this expansive patio and walkway, small pavers could appear too busy and actually make the space look smaller. Kastle Flats’ slabs fit the large space more comfortably. Don’t pour a concrete pool deck! 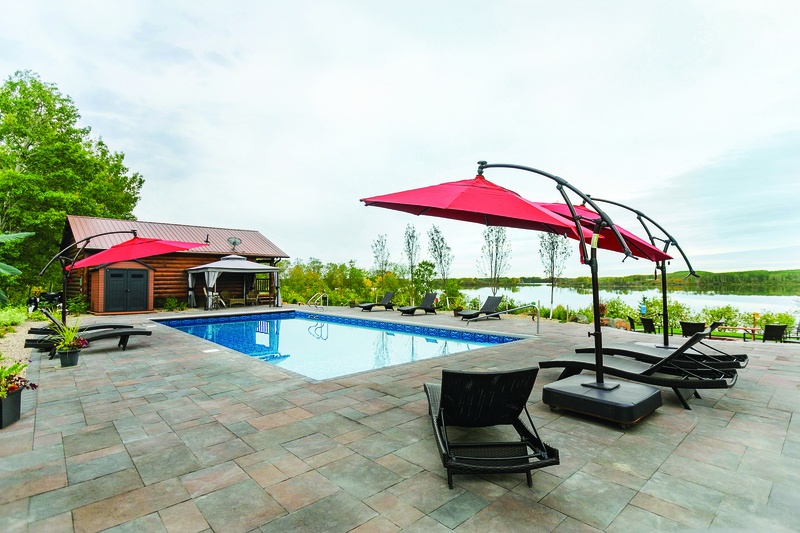 Instead, create a high-end poolside experience with Kastle Flats slabs. This beautiful patio shows the color variations in the Classic Bronze color family. Notice how the colors differ slightly to create yet another unique look. To learn more about the Kastle Flats slab, or to get a custom quote, visit the product page and contact us today. There are many benefits to using a system of permeable interlocking concrete pavements for a walkway, driveway or parking lot. In addition to aesthetic appeal and durability, our interlocking concrete paver systems offer a stormwater management solution that functions as a pavement without taking up any extra space. We’ll discuss a few additional benefits of managing stormwater through permeable interlocking concrete pavements below. To learn more, please get in touch! Our permeable interlocking concrete pavement systems naturally filter out harmful pollutants such as oil, grease, nitrates and phosphorous. This reduces the amount of harmful runoff and improves the overall quality of the water. In addition, the water is naturally cooled as it infiltrates the system. Stormwater is absorbed and filtered through the interlocking concrete pavements, which prevents water from simply running off toward drains and ditches. This can mitigate downstream flooding while recharging the existing groundwater. Installing a permeable interlocking concrete pavement system will eliminate the need for a separate stormwater management system, saving both space and money. Our systems do not frost, heave or crack, and ice does not form on the pavement surface. The systems have the same durability and strength as traditional interlocking concrete pavements, and maintenance is easy. Borgert Products permeable interlocking concrete pavements are an attractive, durable and cost-effective system for managing stormwater on parking lots, driveways and walkways. Systems are ADA compliant and may qualify for LEED credits. To learn more about the many benefits of these systems or to get a custom quote, visit our permeable product pages or contact us today. If you’ve browsed Pinterest or Houzz for patio inspiration, you’ve probably seen a lot of images of big, beautiful patios, with a fireplace, large grill, lounge seating and a table for 10. But what if you, like many of us, simply don’t have that kind of space? A small patio can still be a comfortable, lovely space to enjoy the warm months. It just may take a bit more creativity. We’ll share some of our favorite small patio ideas from Houzz. We’d love to see your small patios – share ideas and photos on our Facebook page! Turn a wall into a bench to add seating without taking up extra space. Using the same pavers on the patio and surrounding spaces (i.e. walkways and steps) will avoid visual disruption, making the patio appear larger than it actually is. Lighting can make a huge difference in the atmosphere of a patio. 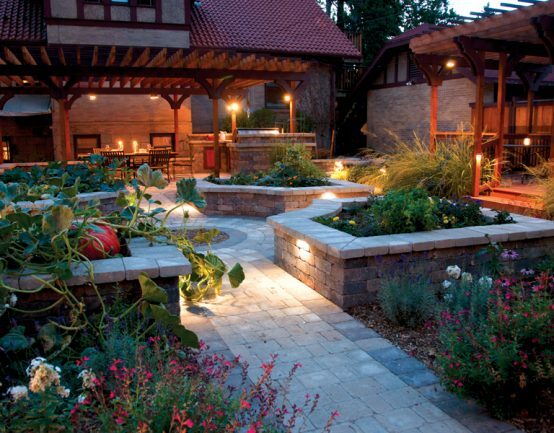 Use lanterns and stakes at ground level to create ambience without taking up much space. If you have a long, narrow patio, choose a table with the same dimensions. You could also push the table against one wall to add space, pulling it out only when you have a larger number of dinner guests. A bistro table and chairs won’t take up visual space on a patio, and is easy to fold up and put away when not in use. Add greenery without sacrificing space by choosing climbing plants and trellises. Brightly-colored plants, furniture and furnishings will give your patio a unique, sophisticated flair, no matter its size. Ready to upgrade your patio? 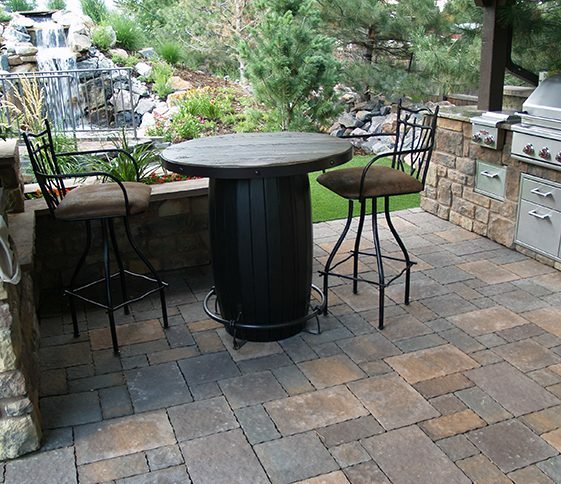 Visit our product gallery to find the best pavers for your small patio! Will this be the year that you finally get rid of that old, cracked or crumbling concrete patio? Tearing up a concrete patio and replacing it with durable, versatile Borgert Products pavers is a great way to update the look and feel of your yard, as well add visual appeal and value to your home. Tearing up a concrete patio seems daunting, but it doesn’t have to be. With the right equipment (or a good contractor), it can be done quickly and easily. Read on for tips from the experts at Houzz. Project considerations: Utilities should be contacted to ensure that there aren’t any gas lines beneath the patio. The project will probably be noisy, so it’s a good idea to give neighbors a heads-up. Permit required: Typically no permit will be required for the demolition, but it’s a good idea to check with the city just in case. Before beginning demolition, place plywood over nearby windows, in case pieces of concrete spray and crack or break the glass. Next, begin removing the concrete! If you’re not removing the entire patio but just reducing its size, use a concrete cutting saw to cut concrete joints out. If you’re taking out the whole patio, use the saw and a jackhammer to break the concrete into chunks that can be manually removed. Check with your municipality for guidelines on how to dispose of old concrete, or repurpose it somewhere else in your outdoor space, such as a stacked garden wall. 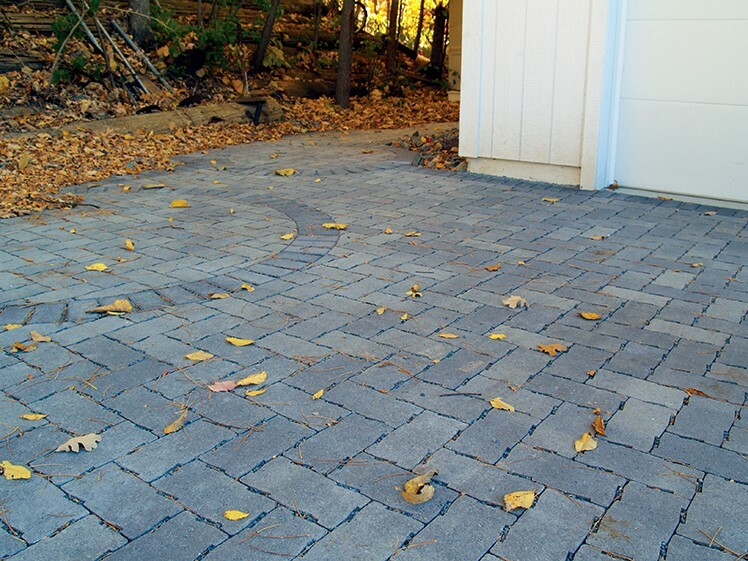 Finally, replace that old outdated patio with beautiful and durable Borgert pavers! Check out our galleries for patio inspiration, or request a catalog! A fireplace is a practical and eye-catching addition to any patio or outdoor space. In addition to the visual impact, an outdoor fireplace will provide warmth, effectively extending the life of your patio during the cooler spring and fall months. 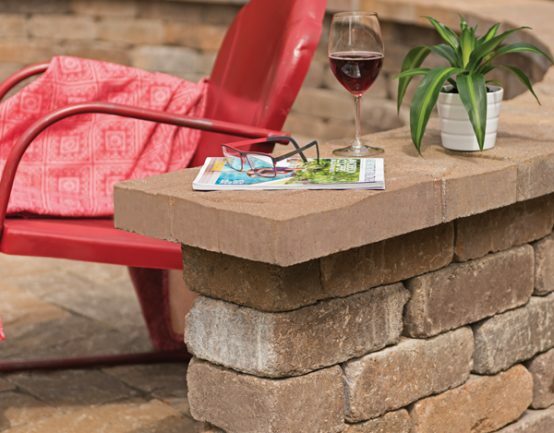 As an exclusive dealer of King of Hearths fireplaces and ovens, Borgert Products offers an outdoor fireplace unit that is constructed from lightweight concrete. It is fully lined with fire brick for maximum safety. Our fireplaces are engineered for mortarless veneering, and are exceptionally strong, ensuring that they will withstand weather and remain in peak condition for many years. 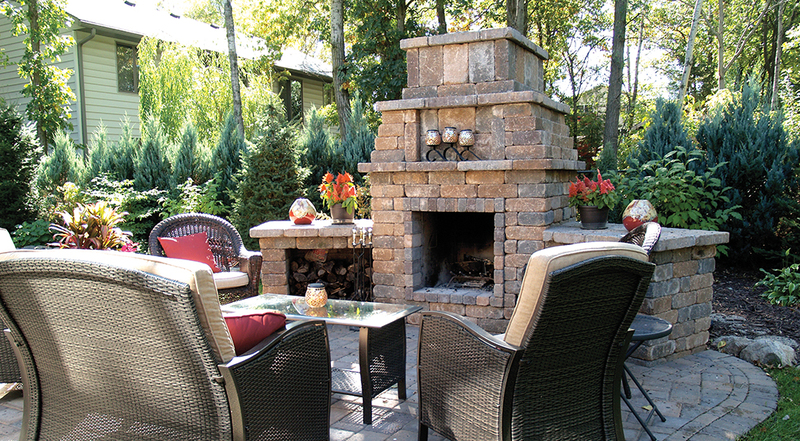 Here are a few tips on outdoor fireplace installation. For a detailed step-by-step installation guide, visit our Borgert Resource Guide. You will need to remove all plant matter and topsoil from under the slab or hearth. Replace that organic material with gravel which must be compacted for support. If a pad is required (which will depend on fireplace size and positioning), ensure it’s at least six inches deep, with other measurements customized to the type and size of the fireplace unit. Install a rebar mat in a checkerboard pattern with 12-inch centers. Cure the pad for seven days before placing the fireplace. Once the fireplace is placed per specific installation instructions, it is recommended to build a few small fireplaces before the facing is applied. This will temper the unit, helping to bring the materials to a near final rest before the facing is applied. There should be no combustible materials placed within four feet of the fireplace opening. This includes trees and plants, wood decking and furniture. The fireplace stack is equipped for a chimney cap – ensure that the cap has a spark arrestor. Only burn wood; never garbage or other materials. Make sure the burning area is completely dry before starting a fire. 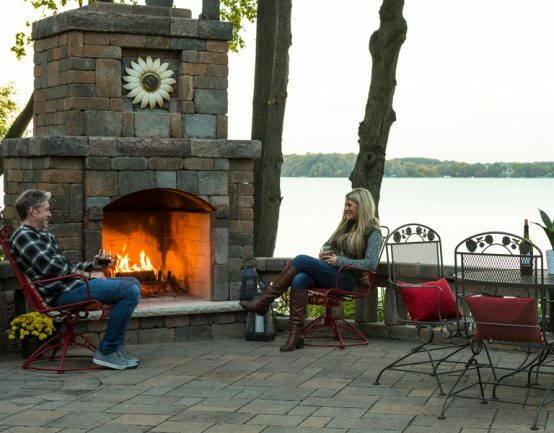 Get the most out of our short Midwest summers with a Borgert Products outdoor fireplace. Contact us to get started. Here in the Midwest, winters are long and summers are short. Many homeowners spend a good deal of time and money on gardens, lawns and patios, creating beautiful outdoor spaces that allow us to enjoy those short summer months to the fullest. With winter well underway, now is the time to make sure your lawn and patio are, in fact, ready for winter. By taking the time to properly winterize, you’ll ensure that your outdoor space is ready as soon as warm weather arrives. 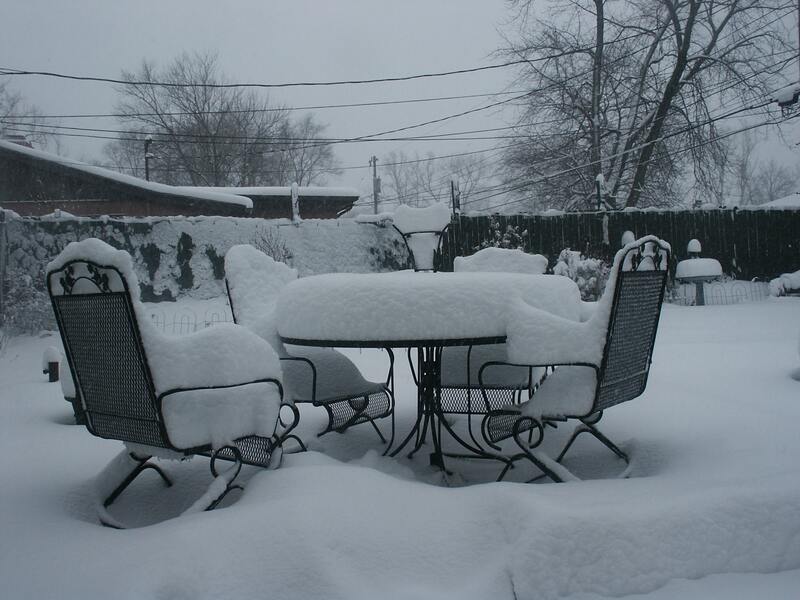 To winterize patio furniture, first give it a good cleaning. Use water to wipe off dirt and debris, and let it dry completely. Then, either store furniture indoors, or cover it with a patio furniture cover that is tightly secured to furniture legs. Use dish soap and water to scrub cushions, then let them dry completely – it’ll probably take a few days. If you find mildew, leave them in the sunlight for a few days, then rub loose mold spores with a dry sponge. Once cushions are dry, store them indoors in a garbage bag or old sheet. The umbrella’s fabric and level of cleanliness will dictate how it should be cleaned. If the umbrella just has loose dirt on top, simply brush it off. If it needs to be scrubbed, use dish soap and a sponge. For vinyl umbrellas, look for detergent that’s made for convertible car tops. Then, let the umbrella dry completely (are you sensing a theme?) and store it indoors. Before cleaning the grill, turn it on for a few minutes to burn off residue. Turn it off and use a wire brush to scrape off any remaining bits of food. Wash the grate and grease tray with soapy water, and wipe down the exterior surfaces. Detach the propane tank before moving the grill indoors for the winter – cover it loosely with a large plastic bag and store it in a safe spot. If you leave the grill outdoors, make sure it’s tightly covered. Winter is long, but spring will be here before you know it. Keep those long, warm nights in mind while you winterize! Are you ready to upgrade your patio for summer? Give us a call. 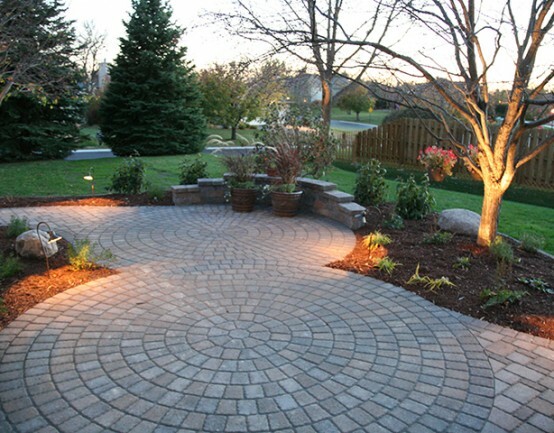 Borgert is a family-owned company specializing in pavers, patios, driveways and retaining walls. We are based in Minneapolis and serve the entire Twin Cities metro area and beyond. Since 1923, we have been committed to providing high quality products that help our customers dream landscapes become a reality. Get a quote today on your Borgert products. 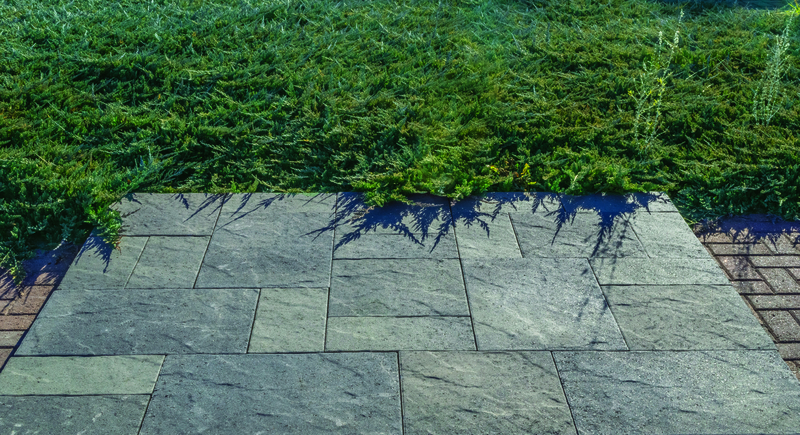 Many think of pavers and pavement products as designed only for patios, walkways and steps. But that’s far from the case. There are several lesser-known applications for Borgert pavements in private and commercial spaces. And by using our versatile, durable products, you can create a space that is unique in appearance and easy to maintain. We’ll discuss a few practical applications for Borgert pavements below, and make sure to visit our project galleries for more ideas and inspiration! If you’re in a cold climate, you know that spring means potholes. The many freeze-thaw cycles that occur throughout the winter weaken asphalt and cause holes to form. This is not the case when streets are surfaced using pavers. Borgert pavements are flexible to withstand freeze-thaw cycles, and any pavers that do crack or break can be replaced quickly, easily and affordably. In addition to the practical benefits, there are aesthetic advantages as well. Create a unique, beautiful space, using pavers instead of paint to delineate lines and spaces. The options are endless! 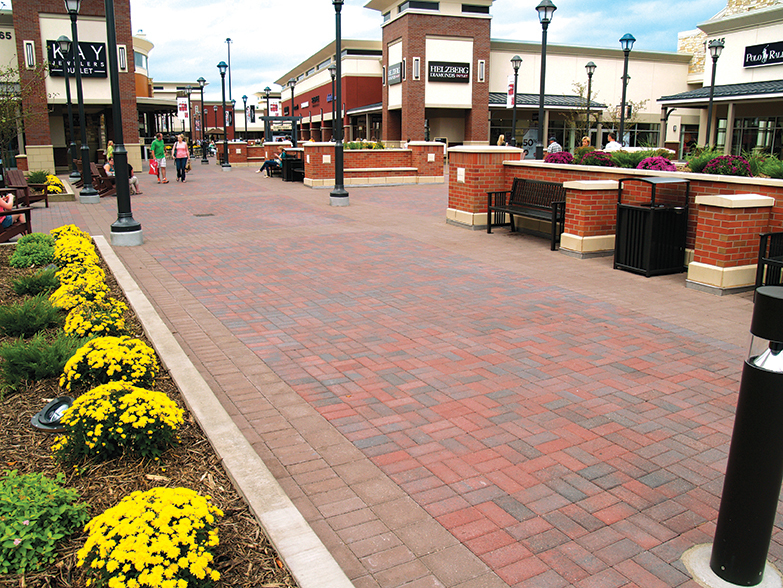 Using pavers in public spaces allows for the creation of unique spaces that can be customized to fit a business or community. Apply pavers in patterns to create a one-of-a-kind design. Our pavements are made to meet the high standards of architects and designers, creating durable and enduring public spaces. Create a memorable first impression and elevate the visitor experience with a unique and easily-identifiable entryway or plaza. Our wide selection allows you to complement existing styles with matching colors and designs. Use different colors and textures to create unity, consistency and visual appeal throughout campus, increasing aesthetic value while lowering maintenance costs. Pavers can be used to delineate spaces or create designs, creating distinction among departments while maintaining unity. Ready to discuss pavement options for your commercial project? Give us a call. Permeable pavements are a great choice for driveways, walkways and patios – for several reasons. The pavements will act as a stormwater management solution, reducing harmful runoff and naturally filtering out pollutants like oil, grease, phosphates and nitrates. Permeable pavements are durable and strong. They don’t frost, heave or crack, and prevent ice from forming. Our DrenaPave™ and DrenaMontage™ permeable pavement systems are perfectly designed for driveways, as well as walkways and patios. Available in three colors and ADA compliant, they’re an excellent choice for any driveway project. 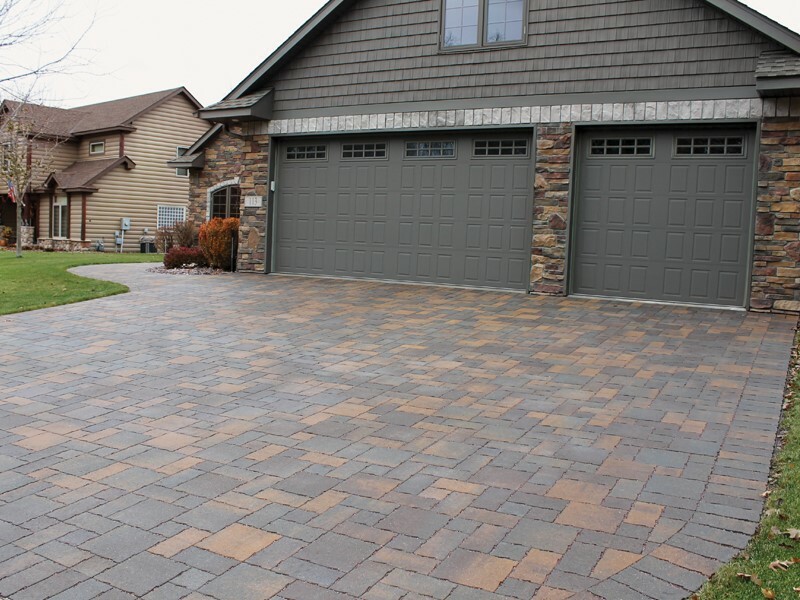 Here are some of our favorite driveway looks to get you started! Add contrast and visual interest to your driveway with radial accents. 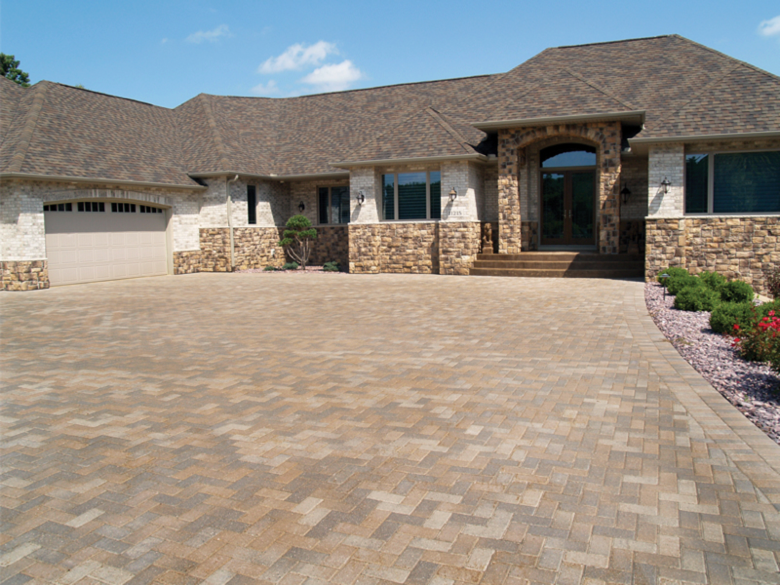 The DrenaPave™ and DrenaMontage™ Permeable Pavements allow for easy customization, so you can achieve the design and look you want! Mix sizes and colors for a unique and memorable look. This is the Minnesota River blend of three colors, which is the only permeable random pattern in this market. There are three size options – 6×6, 6×12 and 12×12. Got a big driveway, patio or walkway? The DrenaPave™ and DrenaMontage™ Permeable Pavements are an affordable and cost-effective option for large-scale projects. Our permeable pavements are perfect for more than just driveways! 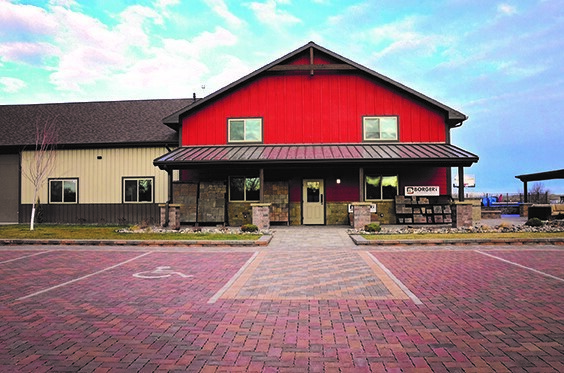 Create a streamlined look throughout the exterior of your home and business by installing DrenaPave™ and DrenaMontage™ in your walkway, patio and even the parking lot! Mix and match colors and sizes for a custom yet cohesive look. Inspired by any of the driveway looks you see here? Let’s chat. 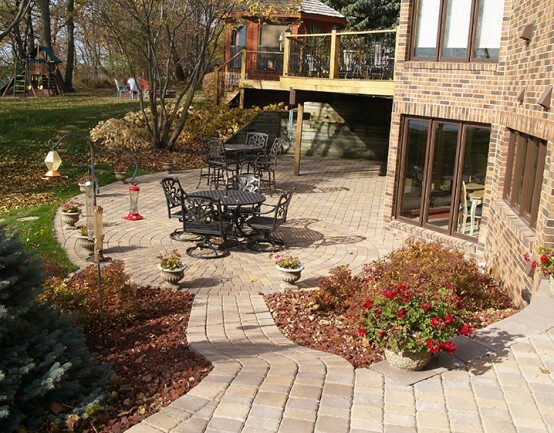 Borgert is a family-owned company specializing in pavers, patios, driveways and retaining walls. We serve the entire Twin Cities metro area and beyond. Since 1923, we have been committed to providing high quality products that help our customers dream landscapes become a reality. Get a quote today on your Borgert products. Borgert is constantly innovating the pavement industry to bring you the best solutions. Did you know how our PanoMur® Retaining Wall saves you money down the line? Borgert PanoMur® Wall is a lighter, more cost-efficient solution to getting more bang for your buck. Our PanoMur® block only weighs 49 lbs. per block versus our competitors’ average 80-82 lbs. per block. 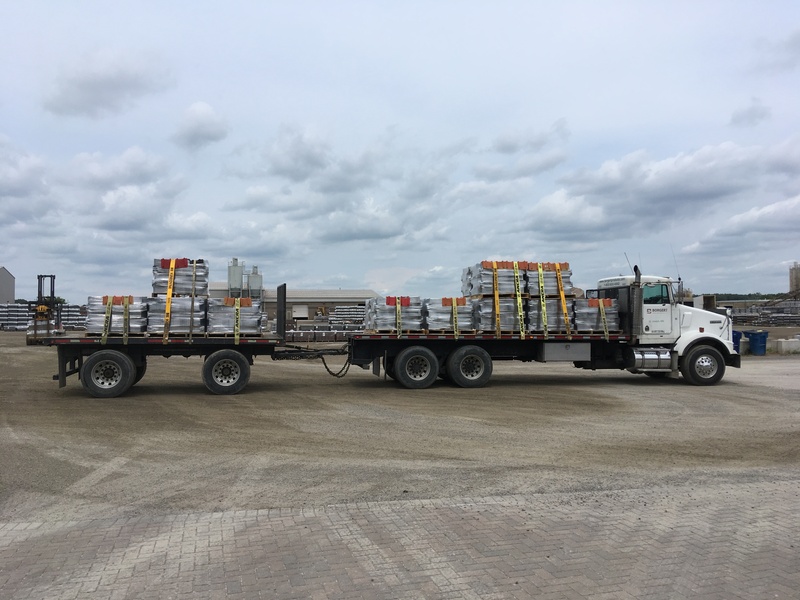 The PanoMur® Wall can fill up about 646.8 square feet on the semi-truck, compared to our competitors’ average of only filling up 386.1 square feet of materials per truck load. This means semis can ship up to 48,000 pounds on one load which is a whopping 21 pallets. That means less trips with the semi and more savings direct to you, as well as less waiting around for larger quantities of stock to arrive. The PanoMur® Wall has a hollow core and these units allow maximum flexibility and ease of installation while maintaining high structural integrity for gravity walls. Currently, the colors available for our PanoMur® Wall units are Sterling Gray, Minnesota River, and Buff, and these units can be curved or straight faced. Another bonus of our PanoMur®Wall is that our block is self-supporting with built-in legs and does not require pins. Check out our PanoMur® Wall in action in our galleries. 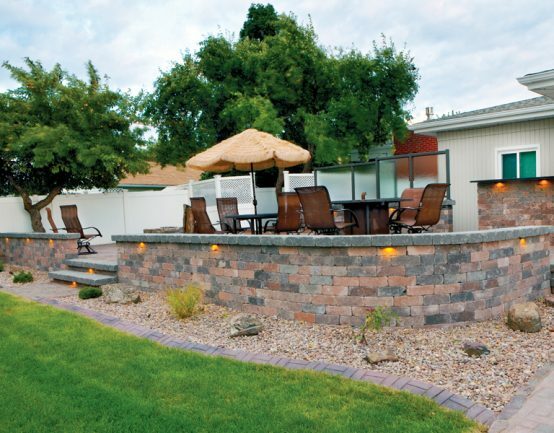 Borgert is a family-owned company specializing in pavers, slabs, and retaining walls. We are based in Central Minnesota and serve the Midwest including MN, WI, ND, IA, SD, Northern IL, MT, CO, NE. Since 1923, we have been committed to providing high quality products that help our customers dream landscapes become a reality. Find your local Borgert distributor. Our Strassen® Wall collection is a free-standing wall, is very versatile, and can complement any backyard feature. These walls can have installed waterfalls, are good for seating walls, can have tops for planting greenery and much more. Be inspired by how Strassen® Walls can enhance your backyard. Escape to a fairy tale oasis that’s complete with greenery planted in Strassen® Walls, perfectly placed spotlights to light up the path, and a candlelight dinner for two! Invite over friends for a fun evening sitting around a fire ring and enjoying the outdoors. Feel secluded from the world and all of its troubles with our enclosed Strassen® Wall and surrounding trees and brush. Splash up your backyard with these colorful Strassen® Walls that use both fun peach spring and summer colors as well as the gray tones that will match the fall and winter seasons. 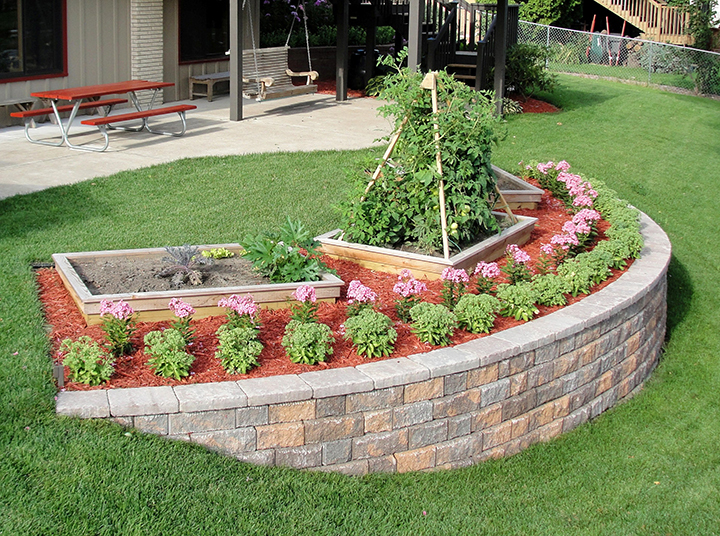 Pair these retaining walls with rock landscaping, grassy areas, tables and more- the possibilities are endless! Sit back and relax after a long day of work. Our Strassen® Walls are not only pieces to enjoy looking at, but they are also practical- no more setting down your drink and magazine under you chair and then tripping over them later! Utilize the Strassen® Wall as a perfect place for setting your books, glasses and more! Enjoy the sounds of nature with the trickling water fall feature installed in our Strassen® Wall. You won’t have to go far to feel like you are sitting by a creek or a waterfall in the forest; you will have your own waterfall in your front yard or backyard! Inspired by any of the looks you see here? Let’s chat. Permeable interlocking concrete pavement is a great stormwater management solution but it must be maintained to ensure proper drainage to get the longest life out of your pavement. The tips below will also ensure that your pavement is able to properly drain rainfall and snow. Joint Material: Keep the joints filled with the proper material, check and refill every 6 months. The fill should reach the top of the chamfer. Surrounding Vegetation and Planting: Ensure that the adjacent landscaping is strong, prevents erosion of soils onto the pavers, and does not contribute to clogging from falling leaves or fruits. Promptly remove grass clippings. Awareness: Ensure anyone working near the site is aware of the system and does not place landscaping materials on the system or close enough to cause future runoff and no snow is piled throughout the winter. Do not allow sanding during the winter. Lack of maintenance will cause the system to clog, defeating the purpose of using permeable pavement. Clogging will also cause deterioration of the paver as it will sit in a constant state of saturation. Snow Removal: Shovel or plow as immediately as possible following a snowfall. Do not pile on permeable surface. Salt/Deicing Chemicals: Do not use sand. The best option is to use the joint material for grit. Salt: When the system is clean and snow is removed promptly, far less salt/deicing chemicals should be used. Use proper judgment to gauge the amount of ice. There will most likely be little ice accumulation on the surface. Regenerative Air Vacuum: when major clogging occurs. Recommended 1 – 2 times a year for commercial applications and once every 1-5 years for residential applications, vacuuming frequency depends on usage. If your pavement is clogged, you can use an air vacuum to remove the top layer of debris and joint material. You can then re-fill the joints and your pavement will infiltrate as normal. If you need assistance, please contact us or icpi.org for more details on maintenance. 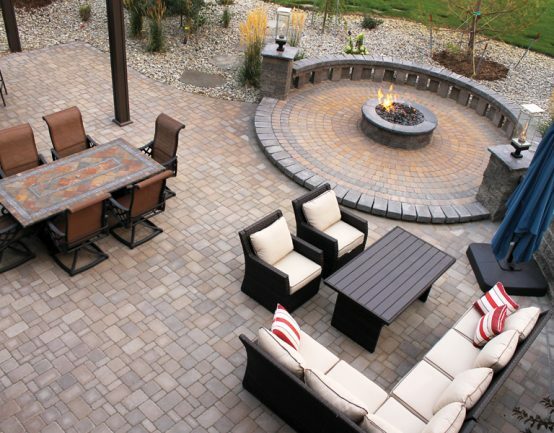 Borgert is a family-owned company specializing in pavers, patios, driveways and retaining walls. We are based in Central Minnesota and serve the Midwest including MN, WI, ND, IA, SD, Northern IL, MT, CO, NE. Since 1923, we have been committed to providing high quality products that help our customers dream landscapes become a reality. Find your local Borgert distributor. Are you searching for that perfect patio look but just haven’t found it quite yet? 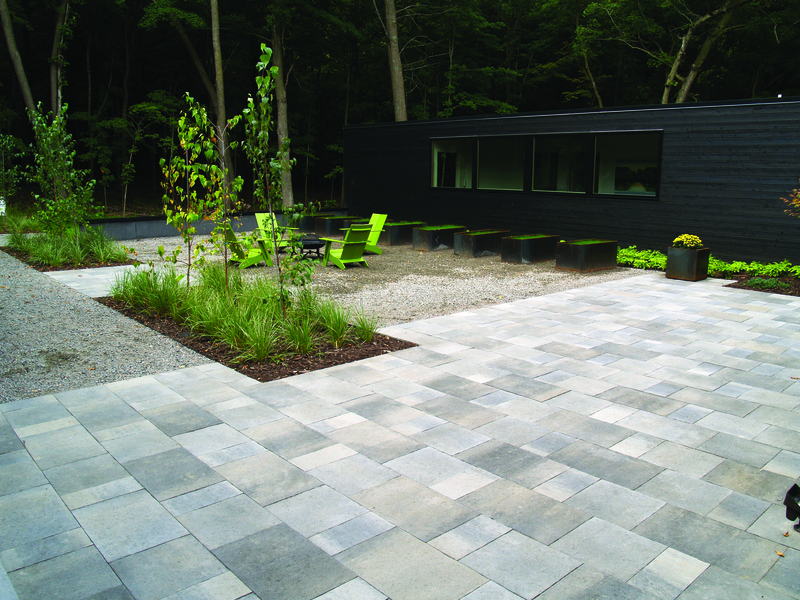 Take a stroll through some of our favorite looks featuring our Cobble Series™ Pavers for some patio inspiration. This look isn’t for the fainthearted. If you really want to cultivate a calming, serene space we recommend pairing our Cobble Series™ Pavers with ambitious landscaping. 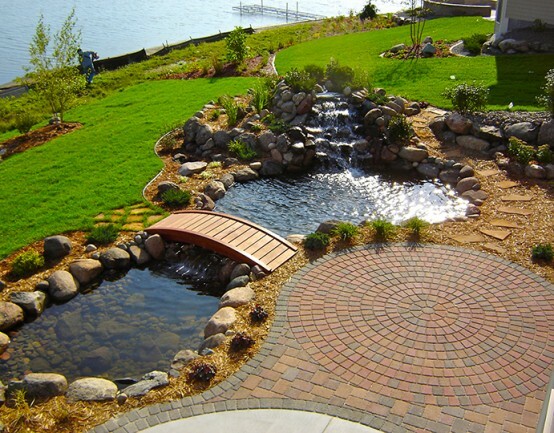 We love how the circular pavers add harmony and balance to the rounded ponds. Pairing natural elements with concrete is the perfect way to create a folksy, enchanting look. We love the combination of our Cobble Series™ Pavers with a fireplace and vines draping around a patio wall. 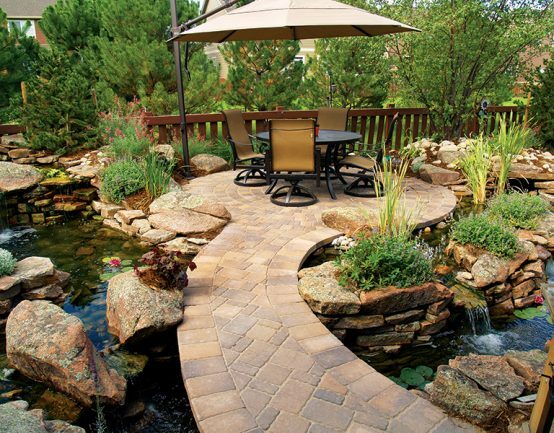 Follow the brick road (Cobble Series™ Pavers) to an oasis in your own backyard! It will feel like you are in a place “somewhere over the rainbow” with surrounding waterfalls and magical landscaping! Experience the outdoors all day. Enjoy brunch on the patio and then go play a game of backyard football for a fun family afternoon! This swirly look is captivating and deceptively simple to install. 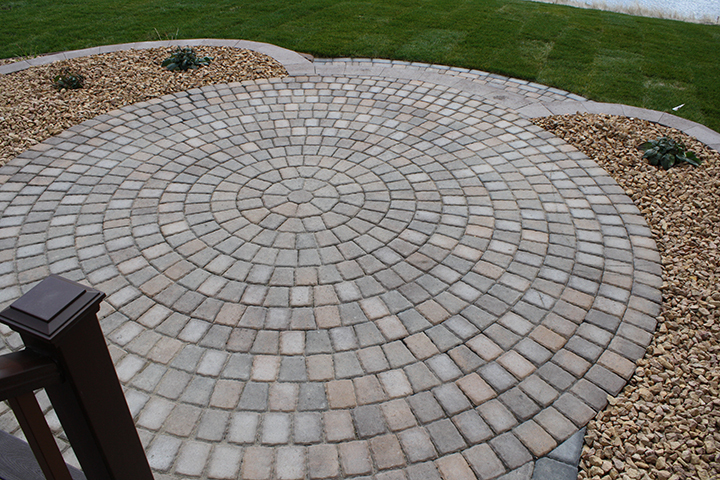 Two circular patterns using our Cobble Series™ Pavers is better than one! These areas are easy to make your own – try adding a wall (as seen above) or some chairs for a nice gathering spot. Now that summer’s in full swing, it’s the perfect time for one of our personal favorite summer activities: hanging by the fire pit. 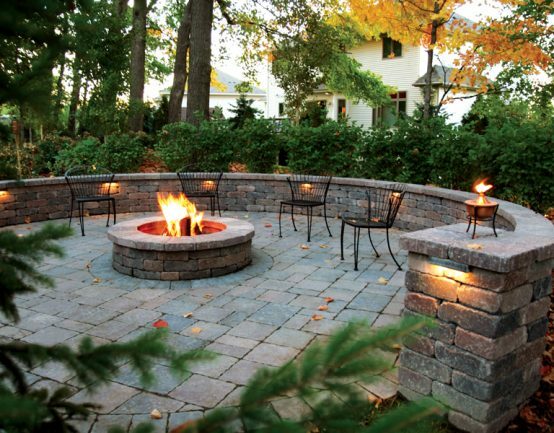 Now’s the perfect time to upgrade your patio with a brand new fire pit or fireplace. Here are some of our favorite looks to inspire you. This classic look is well-rounded (no pun intended). 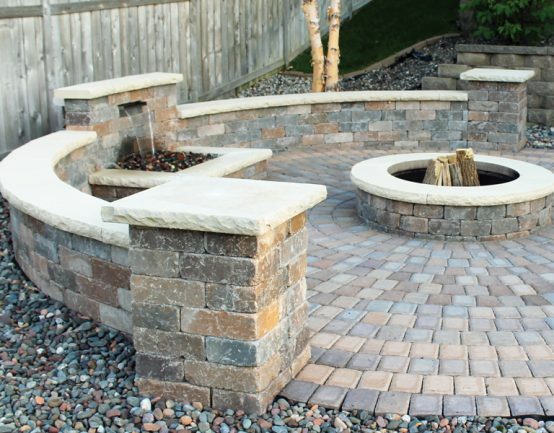 Shake up a simple fire pit by adding a radial pattern with cobble pavers. Placing it in the center of your patio leaves plenty of room for entertaining. Make a gorgeous fireplace even more stunning with a custom detail – we love this simple sunflower to brighten up any patio. Now this is a true home entertainment system! This gorgeous fireplace features convenient storage and an attached TV. 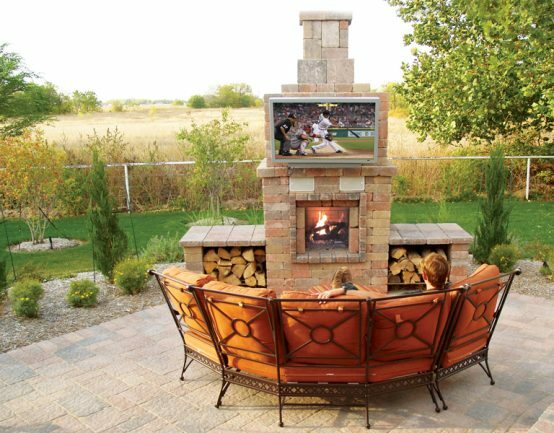 This setup is a must-have for sports fans to grill out while watching the big game. If you love to cook, this is the perfect setup for you! This fireplace features an attached grill for easy grilling and cooking. 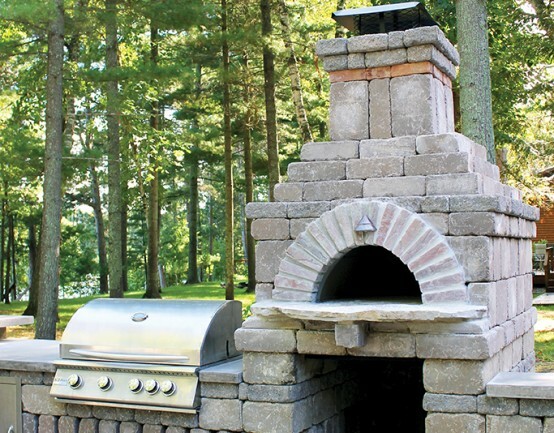 The brick oven is perfect for making delicious pizzas and other tasty treats. 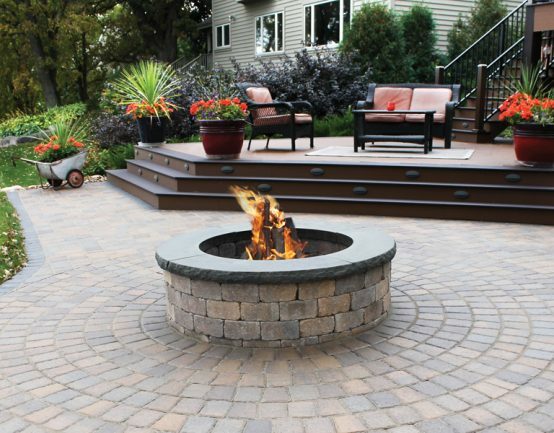 If you’ve got the room, set your fire pit apart from the rest of your patio with a designated space. We love pairing our Cobble Series™ with a wall unit for a designated fire pit space. 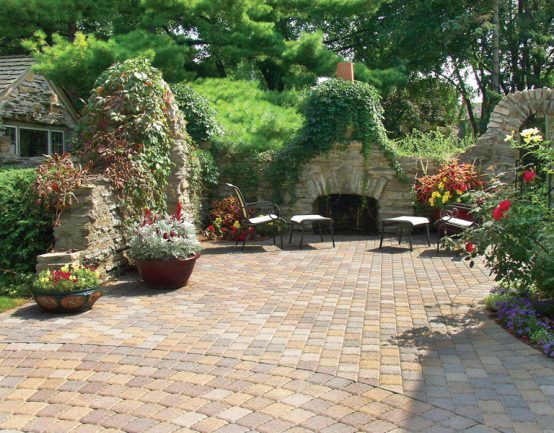 Borgert is a family-owned company specializing in pavers, patios, driveways and retaining walls. We are based in Minneapolis and serve the entire Twin Cities metro area and beyond. Since 1923, we have been committed to providing high quality products that help our customers dream landscapes become a reality. Find a distrubor of Borgert Products near you. Congratulations on your new interlocking concrete pavements! When you’re ready to install, follow these steps for a smooth, uniform look. First measure area you intend to pave. Determine the square footage by multiplying ( length x width= square footage) and add 5% for breakage. Measure lineal feet of open edges and the lineal feet will indicate the PAVE EDGE required. Draw a plan that shows all of the important dimensions and then take this plan to your supplier so that they can help you determine the amount of materials needed for your project. Use the 3-4-5 triangle method to determine a perpendicular line and then measure parallel lines from the perpendicular line to find a boundary. Place stakes at every 4-6 feet and at corners. These stakes should be 8” outside of the edge of the pavers. Note: Before any digging, call your local utility companies to locate any underground lines. Use a flat shovel to cut evenly to remove sod/dirt to a depth of at least 7” to allow room for a 2 ⅜” paver, compacted sand, and a minimum of 4” compacted crushed stone base. If your house has a new foundation, we suggest you increase base thickness to 6” or a total excavation of 9” within 2 ft. of new foundation. Excavation should be 6” wider on sides where the paved edge restraint is to be used. Base Preparation: Use either ¾” or ½” graded base material that includes sizes down to fine dust. Method of Compaction: Run your plate compactor over the excavated soil ( the soil should not get stuck on the bottom of the plate compactor). Each pass should overlap the previous one by 4”. Next, spread your gravel base material out evenly in about 2” layers. Start around the outer perimeter with the plate compactor and again overlap each pass about 4” working towards the center. You should make at least two passes for each layer. Use the hard tooth garden rake to smooth out any unevenness. When you are finished with the base, there should be no more than ¼” maximum gap anywhere along the straight edge and the base. It is best to plan a ¼” per foot drop, but try not to exceed ½” per foot. Sand Setting Bed- ASTM C33: Lay your screen guides ( 1” electrical conduit, 1’ strips of wood or other suitable rigid 1” guide) 4’ ft to 6’ ft apart and parallel. Work from side to side with your screed guides, screed a 10’ section of sand. You will use the 6’ ft. to 8’ ft 2” x 6” to loosely spread the sand and to strike off any excess. Do not walk on your screeded sand. You will fill the voids with sand and trowel them smooth as you are laying the pavers. Starting from a permanent edge, lay your first paver starting from either side ( as you lay your pavers, work right to left, then left to right and so on, one row of pavers at a time). Set the pavers lightly on the sand and allow 6” to pave edge on the open sides later. If you are starting with pave edge, run a string line across the front of the playing edge every 4’ ft.
Set the pavers hand tight, but do not use a hammer to adjust the pavers or set them. Cutting the Pavers: You will need to cut the pavers if you have to go around a post or come up against an existing structure or where a radius is desired. You do not need to cut on sides where pave edge is installed. Mary any stones to be cut with a crayon or chalk and allow for up to ¼” gap between the stone and the edge. This will be filled with sand later. You should use either a diamond blade mason saw or a paver splitter. Before Sand Screeding: Snap chalk line on base material before you screed sand if you are going to start laying your pavers from a pave edge line first. Spike edging so that the chalk line remains visible. Spike every two feet with 10” x ⅜” diameter steel landscape spike. After Pavers Have Been Laid: Finish placing the pave edge spikes. First, use a trowel and cut straight down the side of the pavers into the sand down to the base ad pull back the sand. Be careful not to scrape up the base material. Placing the edging flat onto the base, push pave edge frost heave lip under the sand, using a hammer to tap against the back of the pave edge until the edging is tight to the pavers. Now, spike the edging approximately every two feet. Pound the spikes in until the head of the spike is touching the edging. Use a dry medium or coarse washed sand for the joints, spread a thin layer of the jointing sand over the surface. Use a stiff bristle street broom and sweep back and forth over the entire pavement until sand has stopped filling into joints. Now, alternating between compacting and sweeping, continue to work the material into the joint. If when you make a pass with the plate compactor and no more joints open up, you are then finished.